Drug Store Prints…Yay or Nay?! Since I’ve admitted I’m not an expert, if you came here hoping to see what a real, live professional photographer has to say about the subject check out this post. It’s really well written and gives a ton of insight into some things I would never know…or even think to look for! There are a couple of tips I’d like to mention. First…depending on the settings of your camera, photos may look great on the computer but they, in fact, may not be true 4×6, 5×7, etc. Always check to be sure photos are not being cropped at the photo kiosk. The process is different for each type of kiosk however, always click on the “edit” button. It’s here that you can see any cropping that may occur. Second…NEVER choose “color correct”. This will ensure your photos stay as close to the original as possible. Third…talk to your “drug store” photo employee about what you may need or expect. Depending on the system, employees are able to make some changes to photos. Other changes MUST be made directly at the kiosk. Don’t be afraid to ask questions…they are there to help! Last week I posted my free blank monthly calendar printable. You can see that post here. This week I’ve designed some handwritten calendar months. I printed them on heavy 110lb white card stock and cut them using my Silhouette. 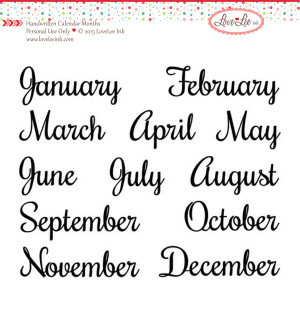 Having them on white will allow me to try different techniques and decorate or embellish depending on my mood and co-ordinate with the calendar I want to use for that month. Yay!! 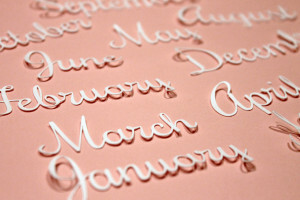 Months – handwritten and cut out. So, for those of you who love these handwritten months as much as I do, the digital files are available for purchase in my store for only 99¢. And if you don’t have a cutting machine? I haven’t forgotten you! You can also purchase the cutouts printed on that heavy 100lb white card stock for $1.99. 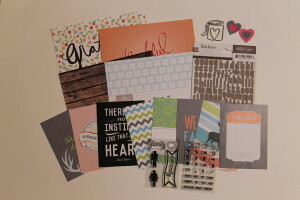 I can’t wait to get my creative juices flowing with these! Hope you enjoy them and, as always, please leave a comment with a link showing how you’ve used them. I’d love to see your work!! Here’s to the New Year!! Happy New Year!! I know, I know…I’m almost a week late but hey, better late then never right?! For 2015, I decided on a different approach…more of a journal/about me album. My life is pretty boring, to be honest, so I also scaled down my album to a 6 x 8. The big plan is to do a monthly layout with a calendar highlighting the important events in my life. I hope you enjoy! Please leave a comment with a link if you use any of these calendars. I’d love to see your work!